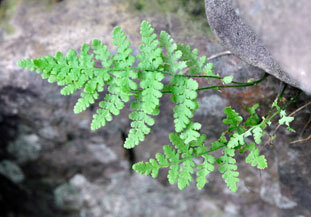 Also Called: Tennessee bladder fern. Culms: Creeping, to 6 inches long, old petiole bases congested; scales tan to pale brown, linear-lanceolate, .08 to .12 inch, glabrous. Leaves: Petiole usually with dark brown base, golden-brown distally, 1.2 to 10 inches long, shorter than blade; blade triangular, 3 to 18 inches long, 1 to 5.5 inches wide, (widest at base), bi-pinnatifid, apex acuminate; pinnae short petiolate, generally perpendicular to rachis, mostly opposite, deltoid to lanceolate, .6 to 3 inches long, .2 to 1.4 inches wide, margins serrate, apex acute to acuminate; pinnules obtusely lobed and toothed, veins running to the teeth and sinuses, pinnules near apex with parallel sides and strongly ascending; indusium cup-shaped, somewhat glandular; sori discrete, round, spiny. Habitat: Moist woodlands, shaded limestone or sandstone crevices or ledges. Uses: The Cherokee took a compound infusion for chills and the Navajo applied a cold, compound infusion on injuries. Comments: The leaves die back in winter. Cystopteris, Greek "Kystos", bladder, and "pteris", fern, alluding to the inflated indusium when young.